The Print Presentation Folders Promos Page is your main source for the latest news and updates on Print Presentation Folders. Print Your Presentation Folders Now! "Everything looks perfect. Thank you for all of your help in this process, your staff was very helpful and shockingly very nice, not to many printing companies are nice to their clients. My designer will be doing more business with your company." "Not only did I receive the pocket folders in perfect condition, the staff of Willy Walt was immensely helpful during the entire process. Top Notch professionalism and some of the best printing prices I've ever found. Where have we been without Willy Walt? A customer for life." Most Presentation Folders ship in 5-8 business days. We can rush them in 2 days turnaround time. or Call us if you have a deadline. Your Presentation Folders will be printed on 12 point card stock and full color on both sides. This creates an attractive, thick, glossy, double sided printed Presentation Folder. 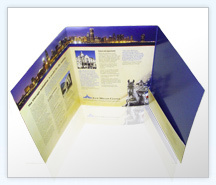 Most people like a 9" x 12" Presentation Folder with 3" flaps and business card slits on one side. However, we have a bunch of different designs you can use. Browse the templates section to get an Idea of the Presentation Folder you are Looking for. Need a cd or dvd slit? No problem! Normal turnaround is 5-8 business days. We can get them done in as little as 2 business days if you're in a rush. Just let us know and we'll check the production schedule. © 2010 Print Presentation Folders All Rights Reserved.